The Saudi Society for Health Administration (SSHA) and Houston Methodist Hospital (HMH) have signed a partnership that aims to deliver leadership training for healthcare professionals through an educational exchange program. The collaboration also aims to exchange the expertise in the training and the scientific fields. With the three-year agreement in place, SSHA and HMH will focus on educating and empowering leadership professionals in a bid to fill capacity gaps in the sector and contribute to the continued development of the professional healthcare community in Saudi Arabia. 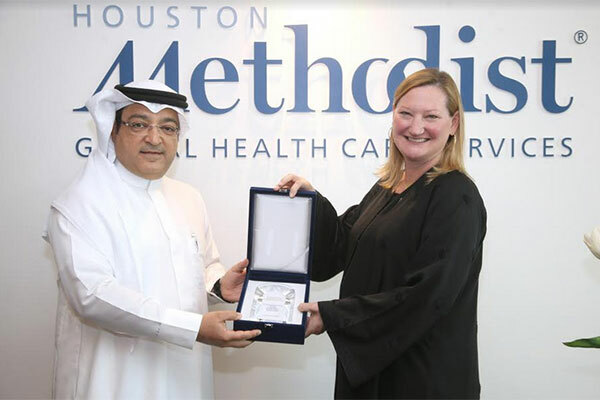 The agreement was signed by Dr Khalid Kheder Khalid, chairman of the Board of the Saudi Society for Health Administration, and Cathy Easter, CEO of Houston Methodist Global Health Care Services, and will see both parties collaborate to develop a comprehensive healthcare leadership skills training program. Built with a patient-centered focus and inter-professional team-based approach, the program will provide training on a wide range of leadership skills including communication, executive strategy development, critical thinking, team management, coaching as well as finance and budgeting. Over the course of the three-year collaboration, over 300 healthcare practitioners and administrators in key leadership positions are expected to benefit, including having direct access to world-class healthcare education at HMH. The program will target a wide range of healthcare institutions including public, private and other governmental hospitals, in line with the government of Saudi Arabia’s prioritization of the development of health care services at the primary, tertiary and secondary levels. “SSHA is continuously seeking strategic partnerships with specialized entities at local and international levels to fortify Saudi Arabia’s healthcare sector. We are achieving this strategic objective in signing this agreement with globally-renowned Houston Methodist Hospital, with its reputation in excellent advisory skills. “Through this new accord, our entities will have the opportunity to exchange professional expertise, specifically with the launch of training programs specialized in guiding healthcare leaders, including practitioners and administrative staff, for employment in public and private hospitals in the Kingdom. We look forward to working with those who wish to contribute to national service through the healthcare sector,” he added. Easter commented: “We are honoured to be considered a trusted health care partner in Saudi Arabia and this collaboration with SSHA only reinforces our mission to further empower healthcare leaders in the Kingdom. In addition to being renowned as a leader in healthcare, Houston Methodist Hospital has long been an educational destination for learners and professionals seeking innovative health and operational training programs. “We are equally proud to be a trusted partner of entities in both the public and private sector who work diligently towards the continued development of the Kingdom’s healthcare capabilities; we have no doubt that this collaborative agreement will be a catalyst to continue to encourage accountability and increase efficiency across the sector as a whole, in line with the Saudi government’s vision 2030”. SSHA will assess and nominate healthcare professionals from across the kingdom to participate in the training program at HMH’s premises in the United States. Eligible candidates must be proficient in written and spoken English, possess a minimum of a Bachelor’s degree and currently occupy a leadership position.